Here you will find the information you need about HOTELS, RESTAURANTS, BUSSINES and CULTURE. Pogradeci is one of the most charming tourist resorts in Albania because of its position near the Lake Ohrid, which distinguishes itself for clear water. Fish Koran, which is similar to the trout, is reared in this lake. Besides the beautiful beach, your staying in Pogradec is made more interesting by the excursion to the tourist center of Drilon (5 km eastward) with crystal fountains that fill the beautiful channels surrounded with trees and by ornamental plants. Or visiting little but very nice villages of Tushemisht and Lin, with lovely beaches and clear water. Where the vine making and agriculture are tradition of every house . 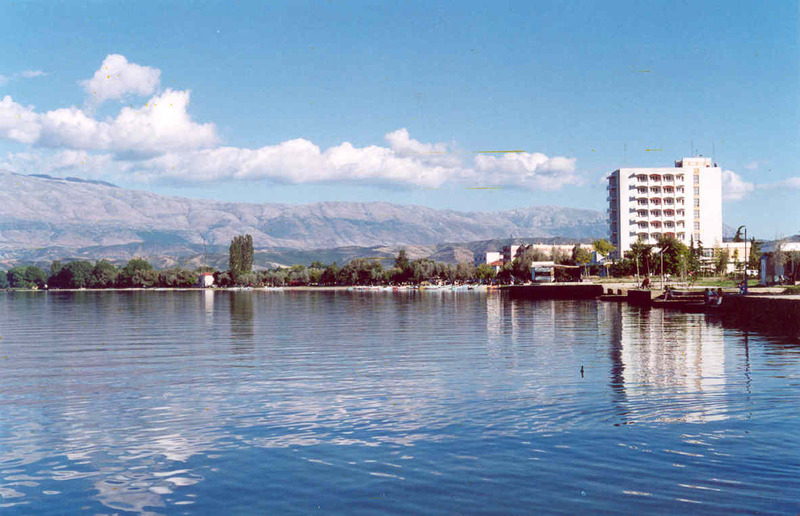 The city of Pogradec lies along magnificent Lake of Ohrid, 695m above sea level. It is bordered by the Lake in north and northeast. In the south and west there are high mountains and hills, stretching from the Mokra Mountains, which create a marvelous crown to the city. The hills are mostly covered with chestnut bushes, some beech and oak trees, fruit trees and vineyards as well. 5 km away, east of the city, lies Drilon, witch stands among the cold and fresh waters that spring from the bottom of the hills. The archeological excavations conducted in a village Lin, North of the district of Pogradec, and in the area of river Leka, show that this area has been inhabited since the era of late Neolitian (6000-2000 years before our era). The area of Pogradec, according to the various archives, was inhabited by Illyrian Enkeleys and Dasarets and it is here where a powerful state was established with castles and small towns called Blace, Selce e Poshtme (Lower Selce), Lin, Castle of Pogradec. century before Christ. They are unique in Europe in the way they are carved on rock.The palo-christian church of Lini located on the peninsula of Lini, by the Lake, is built in the V-IV century before Christ and all floors are paved with mosaic. Other churches in Potkozhan, like that of Saint Marine and other archeological sites such as the mosaics of Lin, the bridge of Golik and others show the beginning of an ancient residence. The Pogradec castle is 689m above the sea level and is close to city. It has been inhabited since the 5th century before Christ. In the middle of 4th century before Christ, this Illyrian residential center was fortified with bulwarks.